JER-DEN Plastics offers a variety of secondary manufacturing services, including flame treating, to provide the exact rotational molded parts you need. When it comes to treating the surfaces of plastic molded parts, flame treating offers many advantages. Many plastics do not “bond” well to adhesives, paints or coatings. Flame treating solves this problem. High speed linear flame treating can increase the surface tension and dyne level on the plastic – which can help prepare the component for gluing, painting, or printing. By increasing the surface tension, flame treating allows adhesives, glue, ink, dye, paint or even decals to better adhere to the substrate. Flame treating is also ideal for achieving smoothest plastic finishes. “Flame Surface Trimming” is a specific type of flame treating that can be used to “smooth” the surface of a plastic part or product. For instance, the flame trimmer can trace a path – such as a parting line – to eliminate the line and create a smoother finish. Plastic “pinholing” is another potential problem that flame treating can eliminate. Transit, manual handling, abrasion or everyday usage can result in microscopic “pinholing” of plastic products. These tiny (invisible) pinholes eventually degrade the integrity of the plastic and can result in cracking, bending or puncturing. However, proper flame treating of plastic surfaces can eliminate pinholing and preserve the strength and durability of the product. 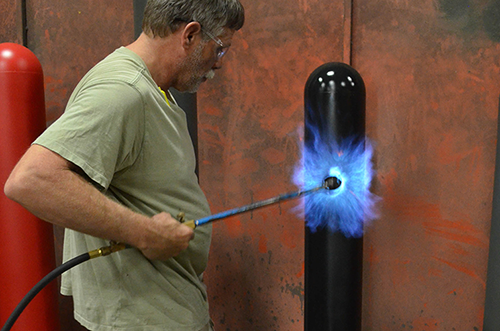 Our state-of-the-art flame treating equipment – and our years of flame treating experience – ensure that your plastic parts will always be manufactured to your exact specifications. We confidently guarantee the highest quality of rotational molding and flame treated plastic products – at the best prices. Contact Jer-Den Plastics today to discuss your rotational molding and flame treating needs.